Garden 4 : Greenhouse. – Dirty wet dog , boats and sailing. Its been another heavy day in the garden here in a rare dry day. Today i have been working on one big job at the back , which is trying to complete the rear garden retaining wall and another big job out front. In the front garden i am re-making the whole of the edge that fronts the road : this being the public ‘face’ of the main vegetable growing area. Today i shifted a metre cube of soil back into the main long bed, moved a load of granite to experiment with finishing the wall so its been a solid day. 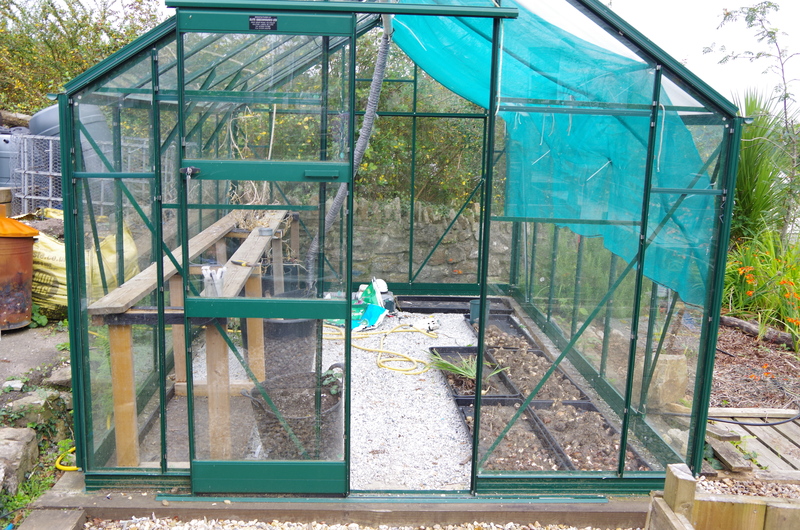 At the end of the day i was completely on empty again bu after a snack and a break i thought i would write the next in the garden series : the thermal mass greenhouse which we put up a few years back early on in the project. The greenhouse is only 12′ by 8′ but plenty large enough for my needs. The ground here was very wet and dense clay when we first came here so the first job was to take a load of it away with the end part of the water feature that was here. The greenhouse sits on a wooden plinth which in turn rests on 6 cast cement pillars which are about a metre down into the clay. The thermal mass effect is gained by a thick layer of granite and stones with an air pipe running through it. The system works by pulling warm (hot) air down from the greenhouse apex via the ventilation pipe and that is blown through the pipe work in the granite mass. The pump here is merely a computer fan driven from a small PV panel outside so it just comes on whenever there is enough sun. One of my next projects is to use an older larger PV panel off the boat and let that charge a battery and run a more powerful fan. This year the granite stone and pipe bedding is still settling so an autumn job will be to add more of the pipe bedding (pea gravel) To aid that job i have temporarily taken out most of the internal structure : i tend to have 6 fixed large planters in trays on the left in there for the tall plants such as peppers and tomatoes. The next things to go in there will be the new bulbs in their spring containers….the old bulbs are ones that are just drying off and they will be going back into the beds in the autumn as i complete the new decorative planting.